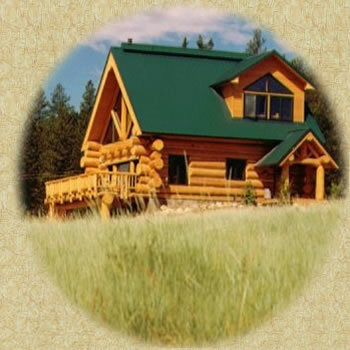 Pedersen Logsmiths has been building handcrafted log homes since 1988, originally as Jeff Pedersen-Logsmith. In 2000, we changed our company name to Pedersen Logsmiths, Inc. It was a change in name only. As a handcrafter, we are dedicated to building a home that is unique to you. Therefore, we do not offer a catalog of plans. We do hope, with this website, to answer some of the questions you may have and give you an understanding of our company and what we offer. We use full length logs that range in size from 10" up to 30" in diameter. Our log building skills are extensive and we offer many log building styles. Since our focus is on the quality of work we do, we build about three to eight homes a year, depending on the size and complexity. 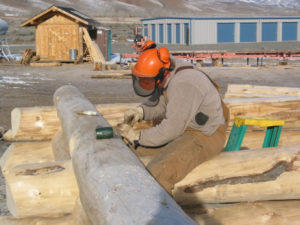 Jeff has been a member of the International Log Builder's Association for 15 years. The ILBA is an organization dedicated to furthering the craft of handcrafted log building, the advancement of log builders and to the promotion of the highest standards of the log building trade. Jeff has served on the board and on the committee to set the standards for chink style building. Pedersen Logsmiths also has pledged to follow and promote the standards of the Pledged Builder Program as set by the ILBA. Our homes have been featured on the cover and in articles in Log Home Living magazine. We also have a feature in the February 2003 issue of Log Home Design Ideas. I hope you find our site helpful and informative. I highly encourage you to spend time browsing our website, especially the Photo Gallery, to see the quality and diversity of our logwork.